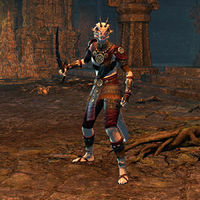 Shuxaltsei is an ancient Argonian priestess who opposed Duskfall and sought to maintain traditional Argonian worship of Sithis through blood sacrifice. She has since become a powerful vampire and was seemingly awakened somewhere beneath Blackrose Prison. Shuxaltsei has taken control of the Teeth of Sithis, an ancient temple to Sithis, and plans to make blood sacrifice to call upon Sithis and return all of Creation to the Void. Defeating her is required to mark the delve as cleared and is also required as part of the quest She Who Eats the Light. Shuxaltsei will summon two Blackguard Bloodfiends. "Sa kot xulneihavu! Sithis tchee shu kronkassa." According to Nisswo Xode, Shuxaltsei's name means Devours-the-Sun. She is also called the High Priestess of Teeth. This page was last modified on 24 February 2019, at 10:37.